The Meadowside is a fun filled children’s playset from Selwood which is designed with small to medium to sized gardens in mind. The Meadowside is one of the smaller climbing frames in the Selwood range and it is similar to the Vigo climbing frame, the Woodchester, the Brightside, the Meadowvale and the Holt climbing frame to name a few from Selwood’s range. 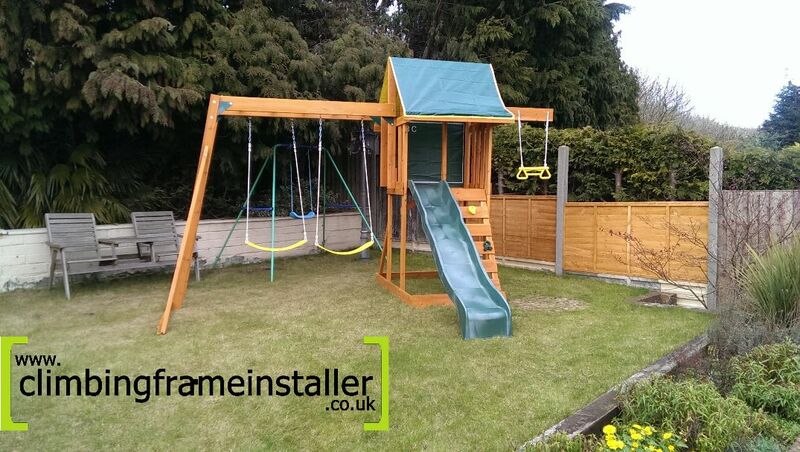 The Meadowside playset features a wooden play fort with a play deck for children to climb to as well as a slide, a rockwall ladder and a combined monkey bar swing beam to save space in your garden. 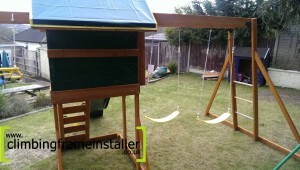 As the Meadowsid e only features a two position swing beam, again to save space, it also includes a trapeze bar on the other side of the play fort as a cantilever swing. The Meadowside is designed in a clever way to save as much space as possible in your garden but also to be a jam packed playset with plenty of fun accessories to keep kids amused. This pretty play frame can be a great way to keep little ones amused and climbing frames are also a fantastic way for children to stay active and healthy. Selwood climbing frames are engineered from cedar wood which is smoothed down to try and get rid of splinters as much as possible but it is always wise to check your playfr ame over for splinters or cracks regularly. 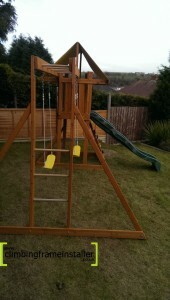 Wooden climbing frames are a natural product therefore will require some maintenance. Our climbin g frame specialists are always happy to conduct regular safety checks or maintenance work throughout the year. The Meadowside climbing frame is a fun outdoor toy for small gardens and it features a wooden play fort for children to climb on. The play fort includes a play deck which stands roughly 1.5m high above the ground. 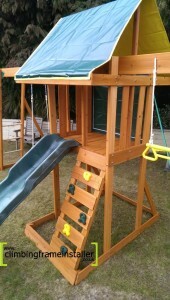 The play fort is covered by a waterproof tarpaulin roof which provides some shelter for the play deck. 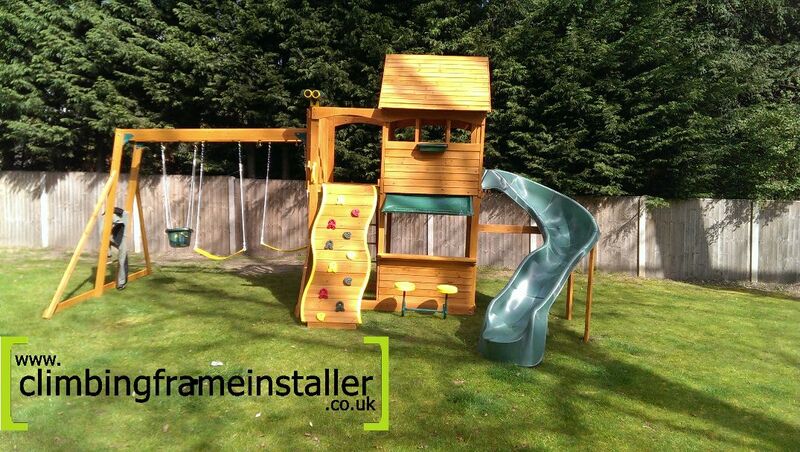 The Meadowside includes a rockwall ladder at the front of the play tower which kids can use to climb to the play deck which features a chalk board on the back wall as an additional accessory too. The Meadowside also includes the straight slide at the front of the play fort for children to use to get down from the p lay deck. The slide is moulded to have high edges especially n earer the top to help prevent tumbles and keep children safely on the slide for a fun and safe ride down from the play deck. 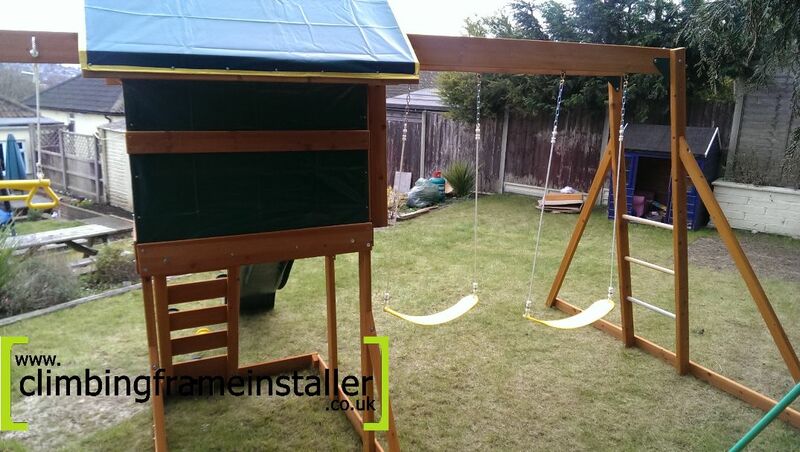 Beneath the play deck is an open play space which is sheltered by the play deck and therefore makes a great area for children to store their outdoor toys in as well as play fun games. 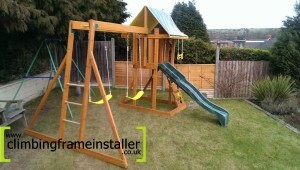 To the side of the play fort is the combined monkey bar swing set. This very popular accessory is featured in many of Selwood’s climbing frames such as the Kinross climbing frame, the Harwood, the Vigo, the Balmain, the Blaise and many more. 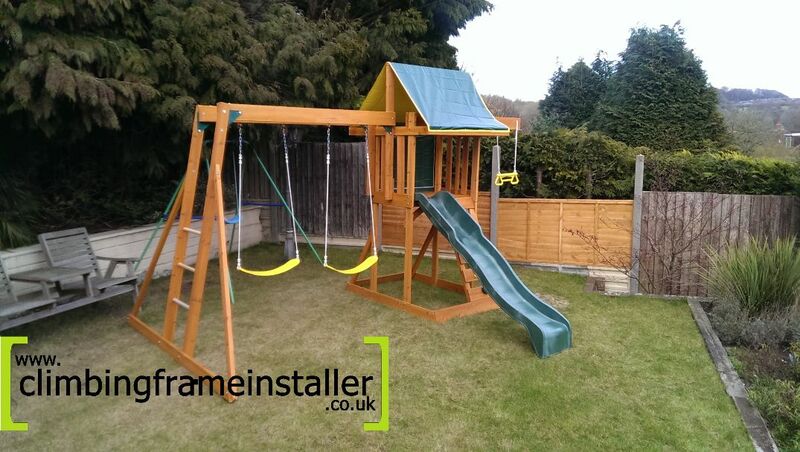 The combined monkey bar swing beam module is designed to save space in gardens and provides two activities in the space of one making it a very handy addition to most climbing frames. For help with the installation of your climbing frame contact the climbing frame installers now. Our professional play frame installers will have your playset assembled in no time and correctly installed so you can be sure your children are safe to play on it. For an affordable but professional climbing frame installation service call us now on 07792309588 or email us at: [email protected].